The vehicle approaches the entrance and driver places the coded card into card reader or punches digital keypad. 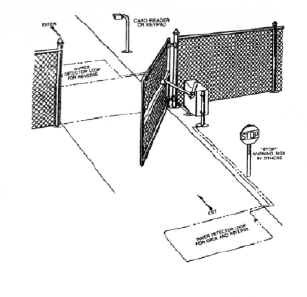 This creates an impulse which actuates the automatic gate operator and opens the gate. As the vehicle goes through the opening, it passes over the "outer loop" and "inner loop," creating an impulse to hold the gate open. When the loops have been cleared, the timer, after a pre-set period, sends an impulse to the automatic gate operator to "close" the gate. If the gate is closing as the vehicle reaches the loop area, the gate reverses to the open position and the timer automatically resets.